A carillon is a special musical instrument. It brings by its sounds an atmosphere of tranquillity and companionableness. A carillon of three or more octaves is an adequate and complete concert instrument. The Carillonneur plays the carillon by depressing the keys of a “baton” type clavier with his fists and by feet from a pedal board. 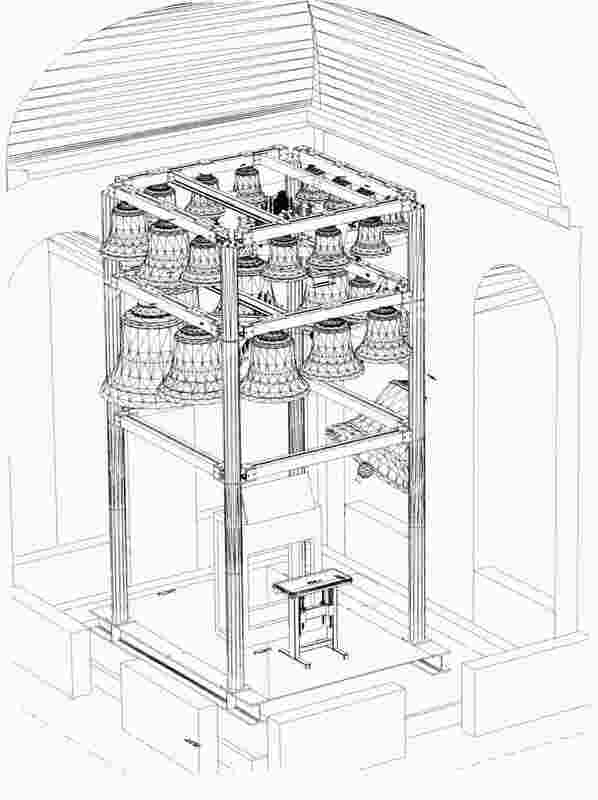 The carillon bells are connected via wire and transmission linkage. On this “baton”type clavier the Carillonneur can play his recitals with variations of force, creating dynamics ranging from pianissimo to fortissimo. In addition to manual clavier play, the carillon cn also be outfitted with automatic functions from a carillon computer. More information on this can be found on “Automatic Carillon Play” in the explanation to the left. Most carillons are located in The Netherlands, Belgium, Denmark, France and The United States of America. In many other countries, however, the popularity is rapidly growing. The Bellfoundry Petit & Fritsen handles the entire process of concept thru delivery of a complete carillon. After a technical survey, a proposal for planning is made complete with preliminary drawings. After initial meetings with the customer are held, the actual work is started. Upon completion, the entire carillon construction is shipped and then hoisted into place by heavy cranes. After installation has been finished, the carillon is then checked for final adjustments with the customer and Carillonneur. For recent delivered carillons (incl. pictures), click here.